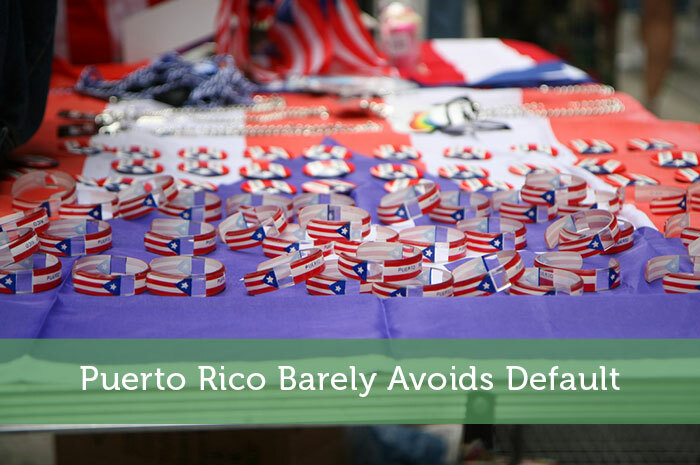 Puerto Rico scrambled to free up enough money to stave off a default earlier this week on a $355 million debt payment, according to Reuters. In an unprecedented event the archipelago announced a plan that would take money from one group of bondholders to pay another. This sounds somewhat like a ponzi scheme but it’s the only option the United States territory has. Speculation was high that it would default on all or at least part of that $355 million of notes that was issued by the Government Development Bank. However they were able to avoid that second default. The first default took place earlier this year in August. Back then Puerto Rico paid only $628,000 of a $58 million payment due on its Public Finance Corp bonds. Had they defaulted this time around the effects would have been very problematic given that the payment fell under a category of debt that must be paid according to the island’s constitution. But even though that debt has been paid, the Governor of Puerto Rico, Alejandro Garcia Padilla, says future payments may not be guaranteed. The island has a $72 billion dollar debt load in total. On Tuesday, the governor renewed his request for congress to grant Puerto Rico the ability to restructure its debt. He said at a Senate Judiciary Committee hearing, “starting today, the commonwealth of Puerto Rico will have to claw back revenues pledged to certain bonds issued in order to maintain essential public services. We have taken this difficult step in the hope that Congress will act soon. But let us be clear, we have no cash left. the emergency measures we have taken maintain essential services are unsustainable.” The next big deadline is on January 1st, 2016, when a total of $945 million is due to creditors from various Puerto Rico entities, including $363 million in general obligation debt service, according to the rating agency, Moody’s. Puerto Rico is in the process of negotiating a debt restructuring with investors which could involve a so-called “Super Bond,” which will just one credit for various existing bonds. One source familiar with the situation said negotiations had been going slowly and will now probably drag into next summer as the Government Development Bank payment figures out a better long term solution. “This just really buys a bit more time for the Commonwealth, but the Puerto Rico leadership better act fast with respect to bond holder negotiations if they want these payments to have been worthwhile,” according to David Tawil, president at hedge fund Maglan Capital. The problem with increasing debt obligations is that the more money a government borrows, the more expensive it is to borrow more. Due to the high default risk, lenders are demanding really high interest rates on Puerto Rico’s debt. Its Highways & Transportation Authority: Bonds which matures on July 2028 last traded for an average yield of 36%, while the Government Development Bank: Federally taxable bonds maturing in 2019 last traded for an average yield of 46%. Puerto Rico’s fiscal crisis should be regarded as a cautionary tale for other U.S. governments. Borrowing money to grow an economy and provide basic public services is expected of a government. But taking on too much debt and risking default is very risky and will jeopardize the standard of living of all its citizens. It’s always better to reevaluate priorities and deal with possible debt restructuring earlier on than waiting for debt to spiral out of control. Will Puerto Rico’s dire situation spread to other parts of the United States? We’ll have to wait and see. The “move to Puerto Rico” chorus seeking low tax rates on the island should realize that this financial disaster may lead to some sort of deal between the US government and Puerto Rico to end the island’s tax incentives. Why Americans are heading to Puerto Rico in search of low taxes when their own mainland government is taxing them to death in sight of record debt is beyond me.